To collect wastewater from individual users and transport collected wastewater to the Wastewater Treatment Plant (WWTP). A lateral/side sewer line carries wastewater from an individual’s home to the main sewer line. Pre-Treatment – Removes materials that can be easily collected from raw wastewater (trash, paper, wood, kitchen refuse) through the screening process and grit chambers. Primary Treatment – Sewage flows through large tanks called “primary clarifiers”, which cause sludge to settle out while oil and grease rise to the surface and skimmed off. 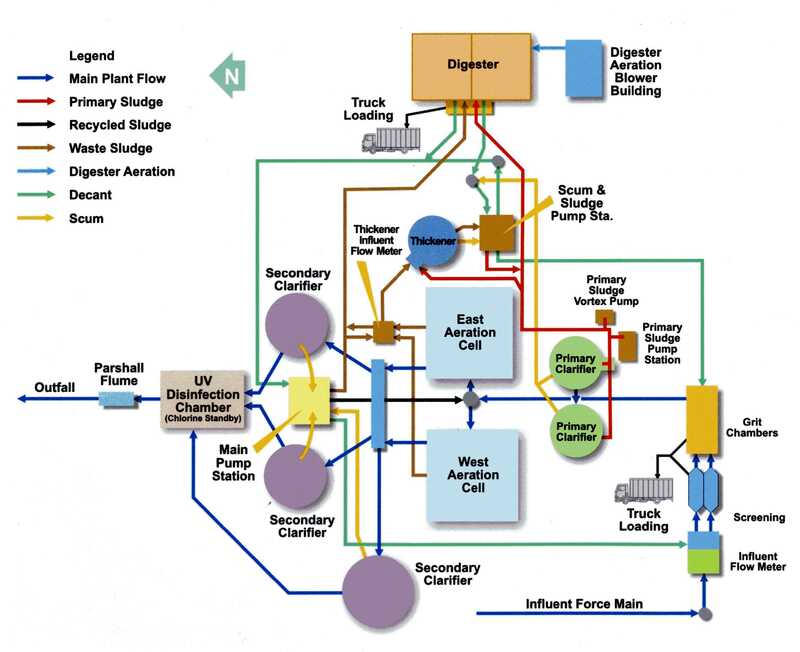 Secondary Treatment – Breaks down the biological content of sewage derived from human waste, food waste, soap and detergent through an activated sludge process. Disinfection – Treated wastewater is disinfected before it is discharged back into the environment. The District uses ultraviolet light for disinfection, which is less harmful than other methods of disinfection such as chlorine and ozone.